Meet Yosemite Sam Hardey, SASS# 44040. I met him at this year’s Prince of the Pistoleer Match last weekend. All I have heard about Yosemite Sam is true, he is a rolemodel for those who are looking for a true Cowboy Action Shooter. 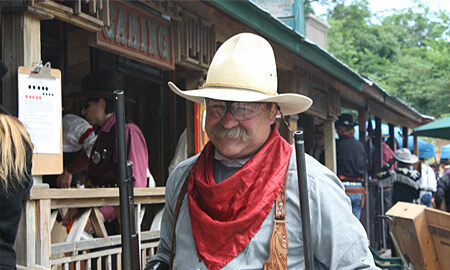 Sam is the ramrod of the CAS division of Chisholm Trail Antique Gun Association in Wichita, KS. Many are not aware of this, but Cowboy Action shoots have been regular events in Wichita since 1992. The monthly shoots are for members only, but twice a year the club hosts a match open to participants from throughout the region. A recent flooding wiped out their western-façade town and Yosemite now has his hands full getting the town erected again. Notice his SASS # and guess what his favorite caliber is. According to himself, he joined SASS when this membership number became available. For more information about Chisholm Trail Antique Gun Association, look up http://www.ctaga.net. Previous articleWhy is there a powder shortage and when will it end? That Yosemite cowpoke looks familiar. Sure thought a WANTED poster was on him down around Oklahoma.